You can't beat a family visit to the pantomime at this time of year and on Saturday we headed to Whitley Bay Playhouse to see this years production of Cinderella. As a family we love Whitley Bay Playhouse, it is not far from where we live and even though it is one of the smaller theatres in the region it is modern with comfortable seats and great views wherever you sit in the audience. We really enjoyed last years production of Aladdin and I did not think they would be able to top it, but they most definitely did. The pantomimes at Whitley Bay Playhouse are produced by Blue Genie entertainment and it is safe to say they put on amazing productions. The cast for this year's production of Cinderella was spot on with local panto legend Steve Walls playing Cinders best friend Buttons and Ray Quinn (from Brookside, X Factor and Dancing on Ice fame) as Prince Charming. 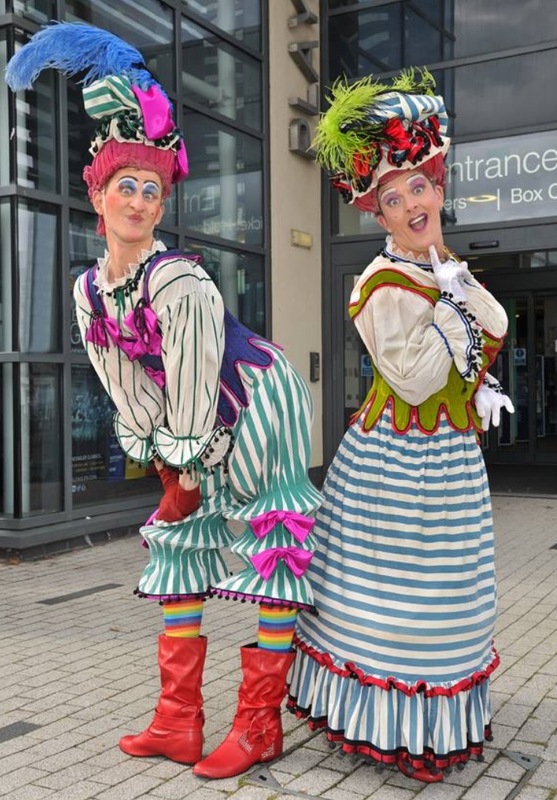 Double Trouble are comedy gold as the very entertaining ugly sisters and Ben Hanson (Tracey Beaker) makes a great side-kick to Prince Charming as Dandini. Cinderella is played by Jessica Pease and David Burton plays her father Baron Hardup. As soon as the curtain lifted we were dazzled by the amazing costumes the cast were wearing and we were laughing along from the start. Steve Walls is a natural at panto he had both the adults and children laughing along with him. I love that they have jokes in for the adults too whilst still being family friendly for the youngsters. Double Trouble who play the ugly sisters Mercedes and Porshe were brilliant and had us crying with laughter at times, from their flamboyant costumes to there jokes and silliness they were real stars of the show. I was equally impressed with Ray Quinn, he didn't take himself too seriously and got plenty of laughs from the audience thanks to Prince Charmings huge ego. He is a brilliant actor and singer and really got stuck into his role, appearing in most of the scenes. 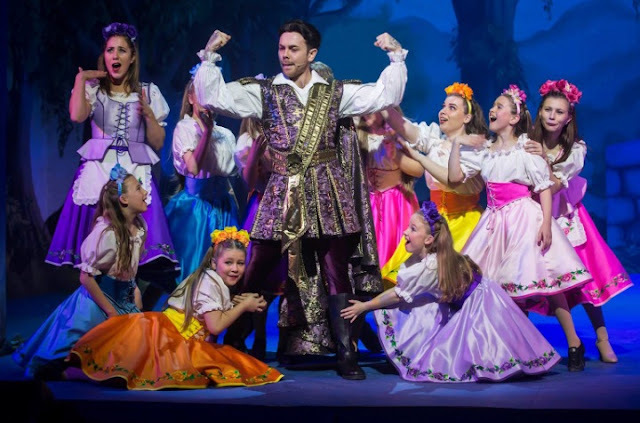 There were plenty of songs throughout the show and the singing from Ray Quinn and Jessica Pease (Cinderella) was pitch perfect with plenty of current songs that the audience knew and loved. Cinderella is a show that we all know and love and I was pleased that they kept all the good bits of the story in whilst adding some really funny slapstick scenes in too. Everyone's favourite Ghostbusters scene had the audience shouting along and was a highlight for my three-year-old son. The Ugly Sisters coming into the audience was a highlight for my teen (as they stole her coat) and the real-life pony was a highlight for my little girl. 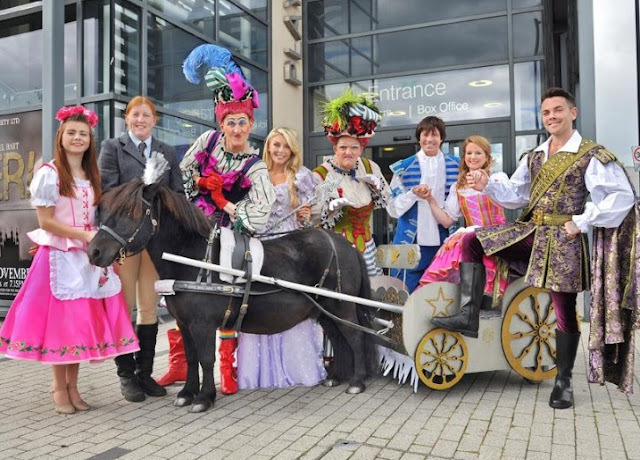 Cinderella really is a pantomime that the whole family will enjoy with a brilliant cast, fantastic costumes and stage set up, slapstick humour and songs you will love. The show managed to keep my children entertained throughout and we were a little bit sad when it came to an end. We enjoyed it that much that we are even thinking of booking to see it again as we all enjoyed it that much. If you are planning on going to see a pantomime in the North East then I recommend you go see this one as it was brilliant and I just know that you will love it as much as we did. You can buy tickets for Cinderella from www.playhousewhitleybay.co.uk with tickets starting at £22 the show will run until the 7th January 2018. The show runs for 2 hours and 25 minutes with a 20-minute interval. Tickets for next years show of Peter Pan also starring Steve Walls are on sale now and I am already looking forward to it. Disclosure I received complimentary tickets to this show for the purpose of this review. I am yet to attend a pantomine and this cinderella one would be awesome to see one day. Oh I love a panto! Haven’t taken the kids to one yet so must look into going this year. I have never been to a pantomime! My kids have gone with their nan but somehow i don't go. I wanted to go this year but the kids nan brought their tickets as a christmas present so i couldn't go with them. I always sounds like they have had fun. One year I will go. Those ugly sisters looks well funny! Ah, I am glad you liked it! I haven't been to a Panto for years and I am ashamed to say my kids have never been to one - I tried to get them to go when they were younger, but they weren't interested! I really like Ray Quinn, so this would be a good one to see! I haven't been to a Pantomime since I was a kid. The good seats had already sold out when we moved to Edinburgh in late summer, but next year we will be prepared! E.ON Go Online Tariff - How Much Could You Save?